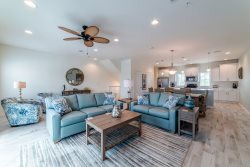 Gulf Side Villa is a rare, 8-unit low-rise condominium located directly on the sparkling Gulf of Mexico with a private patio overlooking Perdido Key's beautiful blue waters and sugar white beaches. This beachfront bungalow is a short walk up to the raised 1st floor where the west end location has the most amazing views! We're not sure which you'll love more--the balcony views or the well-appointed furnishings. This affordable condo is truly a little slice of beach paradise.